UNCG Biology, the Office of Sponsored Programs, and the Office of Research and Engagement invite you to a special event on Feb 11, 2019. Mark your calendars and RSVP now for a conversation with Dr. Leslie Risser, NSF Acting Deputy Director for Environmental Biology. A healthy and globally competitive society must draw scientists from all parts of its community. Yet women remain underrepresented in all science and engineering fields in academia. 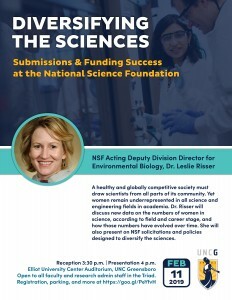 The NSF’s Acting Deputy Division Director for Environmental Biology will discuss new data on the numbers of women in science, according to field and career stage, and how those numbers have evolved over time. 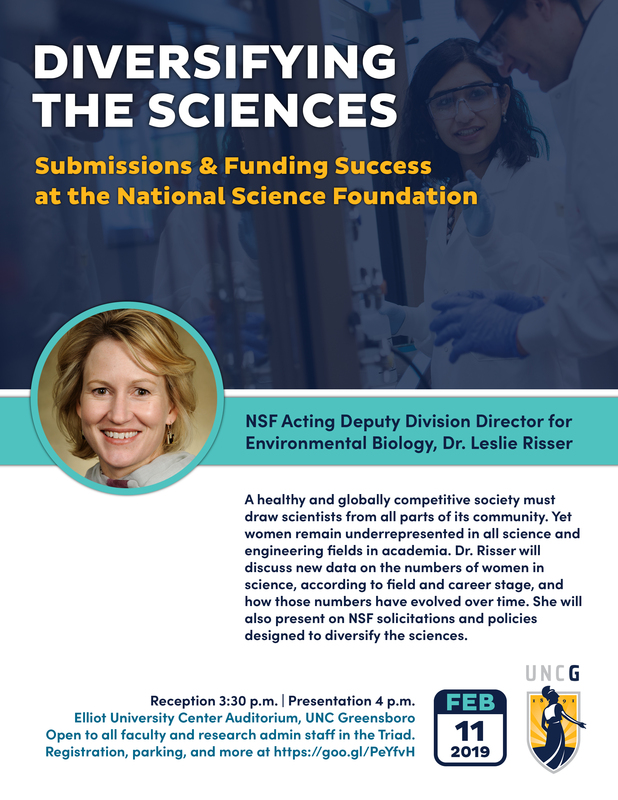 Dr. Rissler will also present on NSF solicitations and policies designed to diversify the sciences. Open to all faculty and research admin staff in the Triad. For more information or to receive this notice through email, contact aubreyturner@uncg.edu. This entry was posted in News, workshop and tagged NSF. Bookmark the permalink.